Are you stumped about how best to remove the stump and roots of a tree after you have taken down the trunk and branches? This is the stump of an over grown Eucalyptus that was removed in spring. The slit was intended to hold weed killer but as the side shoots show it hasn’t worked. (Thank you EU for no help at all see below.) 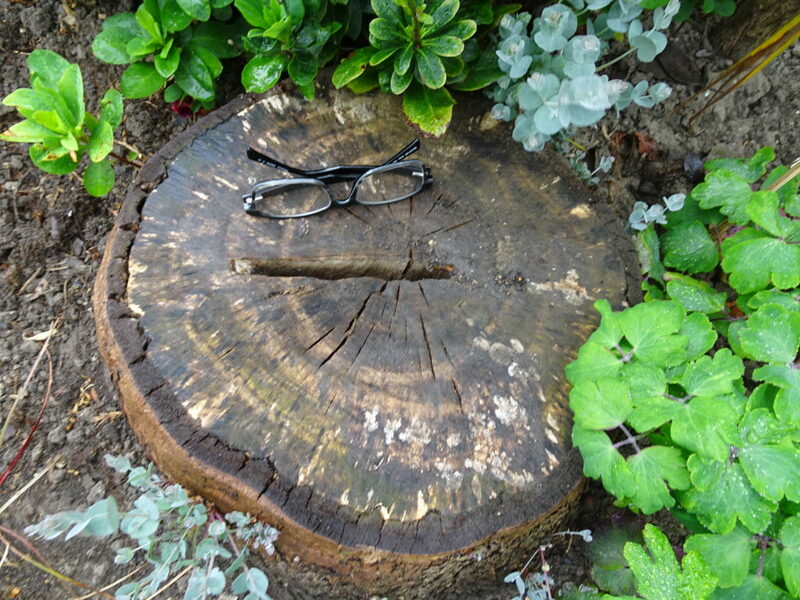 The scale of the stump and thus the size of my digging out problem is shown by my spectacles. I guess I should have known Eucalyptus are successful at regenerating. Stumps left in the ground after felling can cause replanting issues. Roots may get in the way, nutrients may be missing and the stump may look unsightly. When simply felled the old tree can produce new shoots and suckers. Roots may continue to cause uneven surface problems. Grubbing out by hand, spade and mini digger are the first port of call. Winching out using the old trunk as a lever can be done with the right machinery and is often seen in operation on forestry land. The root can be ground out and turned into coarse saw dust with a grinder or chipper often owned by a tree surgeon. Applying brushwood or weed killer containing commercial strength glyphosate or ammonium sulphamate. Drill holes in the stump around the circumference and fill with the weedkiller. Roots should die within a couple of months but the stum will take years to rot away depending on the species. Nature will eventually rot down your stump slightly quicker if you cover it in garden compost so the micro organisms can get to work. In the meantime it can be ‘tarted up’ for other purposes such as part of a stumpery or support for a decorative pot.